Weekend mornings are the best. The earlier I get up, and check out the day, the more in control I feel. If I get up too late, the day will have its way with me. It's a discipline ingrained in me. Just an hour, or so before the rest of the world becomes cognizant of their surroundings is enough for me. I usually will go down into the old sun porch, and watch the light play with the objects in the yard as it rises. Lately, there has been a young cat that has added our back yard to his daily itinerary. This visitor will hunch down on the grass, above one of the hundreds of chipmunk holes we own, and wait. He'll wait for hours sometimes, and then, when he feels it's time, he will sit up, stare off into the opposite direction for a moment or two, and then head off. He'll be back the next day. Our cats will sit and watch him through the glass doors. Occasionally, they will follow his antics in the yard by rushing from window to window. I don't think they know he is real. I think that they think they are watching a reality show on cable, and they are always waiting for the season finale when he actually catches the chipmunk. If he does, well, so much for next seasons shows. It's during this early time of the morning that I will do some further refining of my plans for the day. I'll work out a plan, a schedule, and then, after a second cup of Maxwell House, I'll start to move in earnest. Sometimes those plans are nothing more than walk with Mary around Westville, coffee, and a scone at the Publik House, and then bumble about annoying Mary, and her plans. I like those days, but more often than not we are on the same wave length, and thinking on doing the same project, except when I am planning on building something innovative like the chipmunk death ray in the basement. Sometimes, Mary is up way before me. I'll find her reading from her Kindle in the sun room. Like me, she enjoys the early mornings, and the sun porch is the perfect place to watch it evolve. Today, as I got up, Mary asked, as I sat on the edge of the bed trying to remember my name, what I had planned for the day. I said something unintelligible, smiled, and stumbled off. 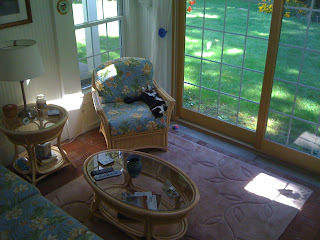 I had yet to muse about it in the sun room, and so I had nothing to give her yet. After a bit of musing, or as some have observed it: staring off into space, I came up stairs, sat behind the desk and began typing. The result is the above bit of early weekend morning rambling, however, during this time I was also able to make a plan for the day. Funny how sometimes I can multitask vast projects, and schedules, and other times I put my shoes on before my socks. Well, as John Wayne once said, "We're burnin' daylight", and I have a day to get a head start on. Well, maybe after just one more cup of coffee, and a bit more musing. Then, of course, there's the shower. Weekend mornings are like this. They just don't have the discipline.